This blog post is based on a presentation I gave at Besides the Screen at the end of November (see my previous post, Rituals of Cinema). This, the very first public appearance of my current research project, talked about two events I attended during the first month of the project, and about how they had started to shape new questions. The two events were Scalarama and the Southside Film Festival. I chose to compare them because both events position themselves very explicitly as a response to a lack or a loss of more institutional sites of exhibition (by which I mean full-time cinemas and arts centres). Since the theme of the conference was Methods and Materials of Curatorship, I was interested in how this response is connected with programming strategies that have their own logic. These observations were made in the early days of my research, and as I have not had direct contact with the organisers, they depend only on publicly available information. My first example was the Scottish part of Scalarama (dubbed ‘Scaledonia’). Scalarama, briefly, is a season of film events loosely associated and supported which runs throughout September in many parts of the United Kingdom and beyond. It started in 2011 as a tribute to the Scala cinema in London, a repertory cinema with a cult following (Jane Giles is currently writing a book about the venue, which I look forward to reading). Its organisation is decentralised, as anyone who wants to have activities included in the programme is only asked to submit a declaration of principles. Scalarama’s own manifesto starts with the demand to “fill the land with cinemas”, using their own minimal definition of cinema: wherever there is a film and an audience, there is cinema. Suggested location types include pubs and boats, and certainly all those kinds of spaces have been used for Scalarama-related events. You could think it ironic that a homage to an actual cinema should look for its place away from the cinema space; in that case, it might be reassuring that this year’s programme has such a high proportion of permanent cinema spaces as venues for Scalarama. 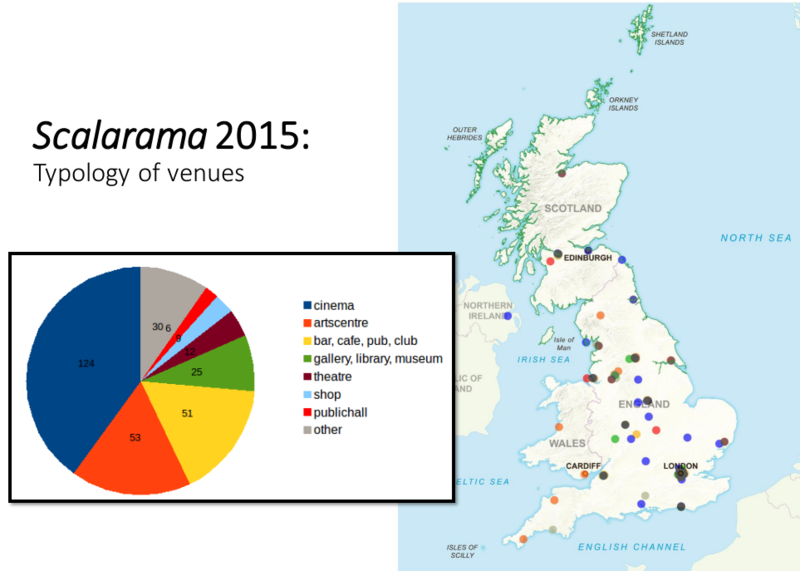 A classification of the 311 events mapped on the Scalarama website for this year shows that over two thirds of the screenings took place in cinemas, theatres, art centres or galleries; that is, in spaces that already have some form of institutional relationship with cinema. The other spaces mainly include bars and pubs, gardens, and community projects. The variety and quirkiness of the venues is perhaps less prominent this year that it has been previously, which might be a trend worth following. A more detailed look shows further patterns. In Scotland, exhibitors taking part in Scalarama organised autonomously, calling their part of the festival ‘Scaledonia’. There were numerically more events in Scotland this year than in previous editions, but only nine venues. 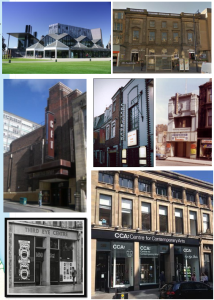 Two of these are arthouse cinemas: the Edinburgh Film House and the Glasgow Film Theatre, two are independent cinemas, the Grosvenor and the Birks, and two of them are arts centres. It is this latter category that covers more events and distorts the picture somehow. This is because the Scalarama programme includes 27 screenings by SQIFF, the Scottish Queer International Film Festival, which ran for the first time this year. This collaboration is, to an extent, simply a consequence of both SQIFF and Scalarama happening at the same time, but it also meant that SQIFF could access Scalarama programming strands like the Shirley Clarke catalogue. Most of the SQIFF screenings take place at the Centre for Contemporary Arts in Glasgow, which has become a convergence point for culture industry workers of different types, and the main site for non-profit film festivals in Glasgow. This is an interesting development, which speaks of a rather close relationship between the film and the art scene which is not entirely surprising in such a small milieu. It does however complicate the structuring distinctions of the field. In her book Film Cultures (2002), Janet Harbord outlined the arthouse cinema and the gallery as two distinct sites for contemporary film exhibition, with their own embodied expectations. The proliferation of arts centres with dedicated screening facilities alongside gallery space, shops, cafes, and office and workshop space is as much a staple of contemporary urban culture as the flashy art galleries. Amongst this trend, the CCA is perhaps a slightly more politicised space, retaining some of its radical roots from when it started as the Third Eye Centre. 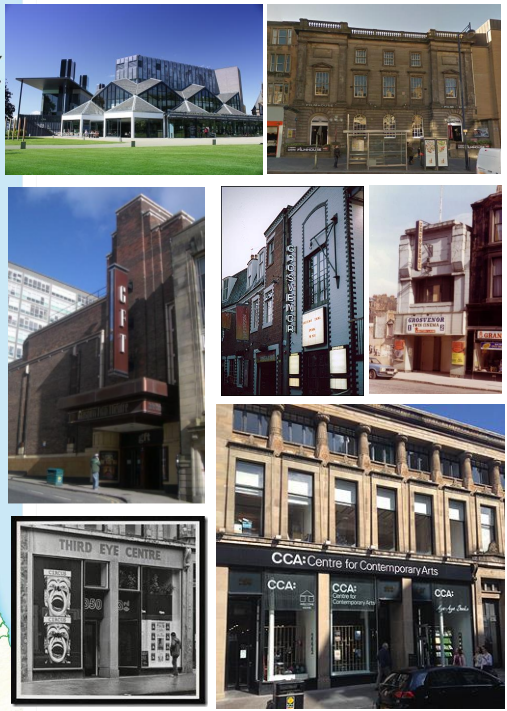 Its centrality to Glasgow’s film culture has a parallel role to the more cinephiliac, middlebrow position of the Glasgow Film Theatre, only a few blocks away. But what about the other Scaledonia venues? Three examples allow us to identify different curatorial strategies in operation. First we have a community cinema in a village hall, in Dunlop which is a village just outside Glasgow. The Community Cinema is supported by Cinema For All (British Federation of Film Societies) and Film Hub Scotland. So this is a regular provision with institutional support. As part of the BFI Film Audience network, locations like this one are the prime target for the curated seasons that the British Film Institute puts together. That constitutes the core of their regular programming. Through these networks, the volunteer-run (but very professional) cinema has access to curatorial expertise and practical support in dealing with distributors. The Dunlop Community Cinema also organise event screenings, such a tea dance to go with the re-release of Brief Encounter, and a Northern Soul night to go with the recently released film of that title. Their base at a multi-purpose hall with a licensed café is helpful, as the chairs can easily be put away for dancing and there is a proscenium stage for performances or presentations. For Scalarama, Dunlop showed the 2012 film Hannah Arendt (Margarethe von Trotta), which linked the programme to the Directed By Women fortnight. Directed By Women is a campaign to encourage exhibitors to show films directed by women during the first two weeks of September, as a ‘worldwide viewing party’. This temporal overlap resulted in a collaboration with Scalarama, who launched ‘Project 51’ as an initiative with the aim of achieving gender equality in exhibition. Hannah Arendt was not, however, one of the core films offered by Scalarama, and even though it is a mainstream biopic, it was a surprising choice for a Saturday evening show, as it is a very discursive meditation on ethics and theory, and large parts of it are in German. It was also very different from other Scalarama-promoted films, as it is neither a cult movie or a nostalgic mainstream movie. This suggests that the association with Scalarama was contingent on the association with the Directed By Women. The volunteers were surprised that their cinema was featured in a national newspaper article about Scalarama, mentioned in the same sentence as the urban arthouse cinemas that seem as a world apart. Closer to the Scalarama ethos was the screening of the Japanese film House (Nobuhiko Obayashi, 1977) organised by Matchbox Cineclub. This was run at the cine-club’s usual place, a bar in Glasgow city centre which has an upstairs room for music gigs, exhibitions, and a wide variety of weird stuff. The screening was on Matchbox’s usual monthly date. Matchbox have been running cult cinema screenings for several years, and this film was not out of character. It was known to the programmers, who have extensive expertise. The film has recently been released on DVD by Eureka, which is one of the distributors working in partnership with Scalarama. So while the Cineclub could have programmed the film at some point anyway, the Scalarama connection facilitated the process. The overlap of these two networks – Radical Film Network and Scalarama – introduces a politicised programming strand branching off the cult aspect. 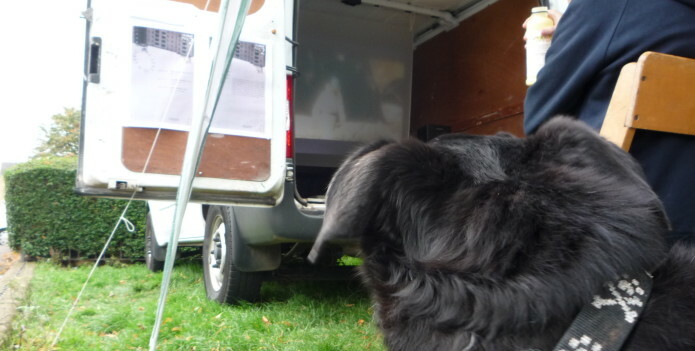 The Glasgow screening was organised by Document Human Rights Film Festival, who are local members of the Radical Film Network – so this thematic shift connects another organisation to the Scalarama scheme. This was a more purely one-off event, at a space with a history of activism. The Govanhill Baths is a public swimming pool that was closed and then occupied by the community. Several community groups and projects are run from its spare rooms. On the day of the screening, the venue had been awarded funding to restore and reopen the swimming pool, so there was a sense of victory. During the screening there was a collection for striking workers at the National Galleries and a solidarity group photo was sent. 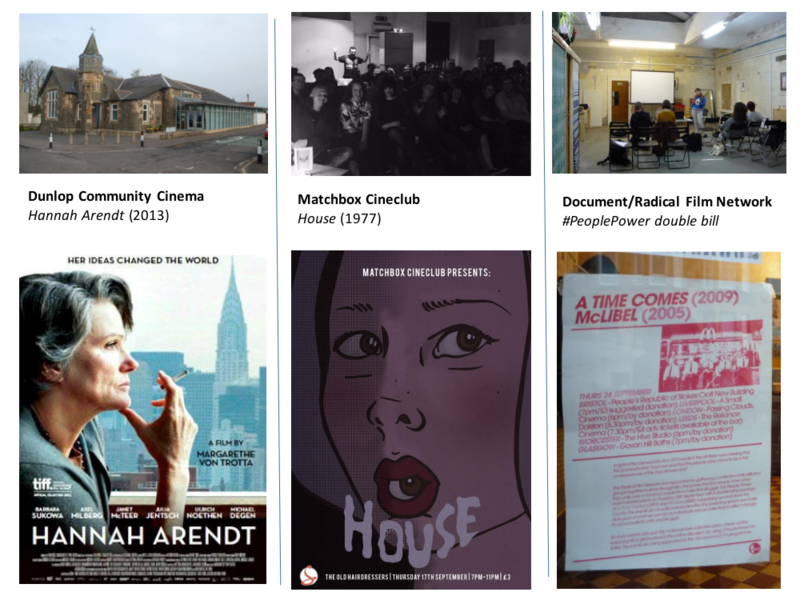 These three examples, thus, engage with modes of practice that come from different traditions: the village hall cinema, the cult movie cine-club, and the activist screening. This draws attention to the very fluid convergence of cinematic practices made visible by something like Scalarama, which started as a celebration of a very specific type of cinema experience. The Southside Film Festival in Glasgow is also, like Scalarama, referencing a loss, but it is a very different beast. This is a much smaller event, offering about two dozen screenings and several workshops over a weekend, and explicitly positioned in relation to a local history of cinema. In this case, the pop-up strategy is not necessarily valorised in itself; it is presented as a response to a lack. In practice, however, there is a lot of creativity and pleasure in programming in unexpected spaces. 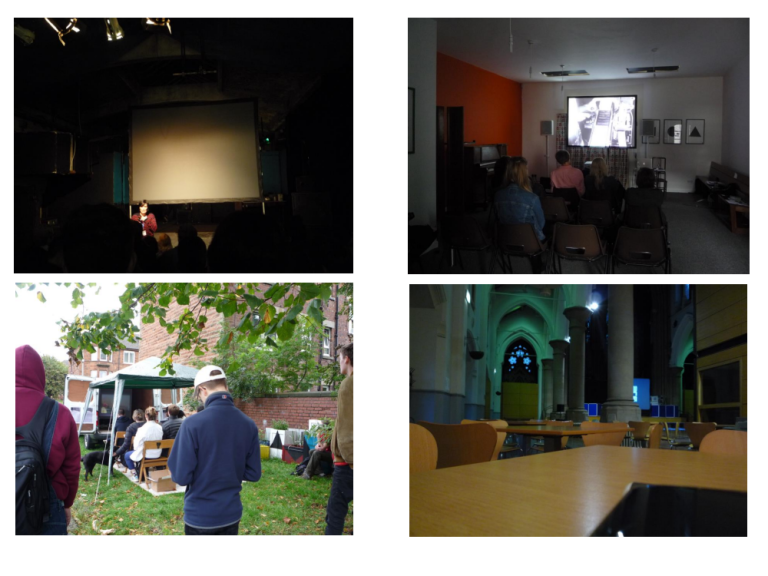 This is a site-specific film festival; the choice of films responds to the choice of venues and the ancillary events available at these locations. So for instance pairing films with food, or using the Wurlitzer organ at the local town hall to accompany silent movies. 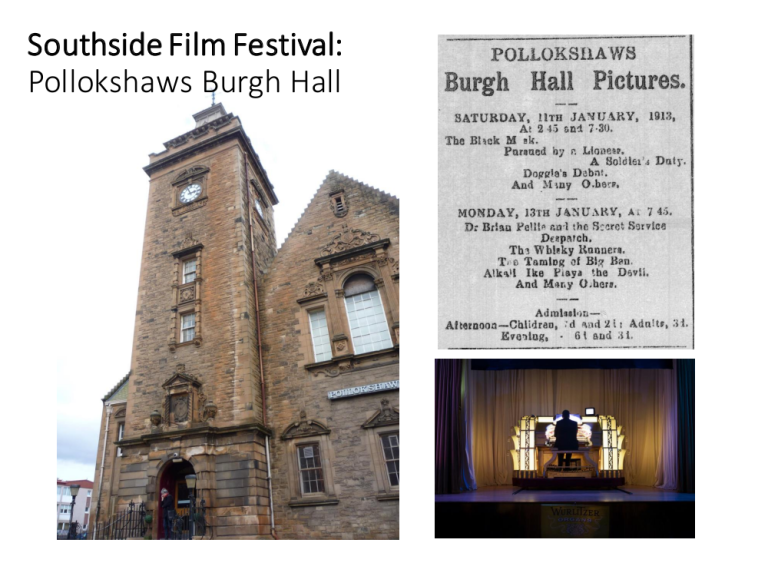 This year the emphasis on history and archives was articulated through an exhibition about the old cinemas of the Southside, and an open call for home movies which were digitised and edited into short films and shown on the opening night. But for all that the festival is so explicitly invested in history, the old cinemas that still stand in the area are yet to be reclaimed for it. The exception is the large Pollokshaws Burgh hall. Here we have an example of a building that has hosted cinema for more than a hundred years without ever becoming a cinema. These histories about what, where, and when cinema is, and where it has been, continue to shape where cinema’s going, even through the apparently novel forms of exhibition practice. Over the next three years I hope to throw away these preliminary ideas several times over, and to make the acquaintance of many of those making cinema happen in every corner of Scotland. If you’re one of them – I’d love to meet you!